It might seem hard to believe, but there really are fake charities out there, after your money or your old clothes that they can then sell for cash. Of course, it’s a gross abuse of generosity – people think they’re giving to a worthwhile cause, when it’s just going into someone’s pocket, but it happens. The sad part is that all too often the fakers get away with it, since we don’t think to question people who are collecting; instead, we simply give. Sometimes the criminals are discovered and prosecuted, but unfortunately, that tends to be a rarity. How Do Fake Charities Operate? All of us receive bags or flyers on our doorsteps or through our letter boxes asking for old clothes for charity, saying the bags will be collected on a certain date. We assume these are legitimate, but at times they’re not. They can be from businesses masquerading as charities, and the supposed charity number might in fact be a limited company number, or even something made up. The bags are picked up, but instead of being used for charity, they’re sold for profit. It’s a business that’s estimated to cost legitimate charities that could really use the money around £1 million a year. In other, even more blatant, instances, people will collect cash for fake charities with buckets. They might say it’s for some specific charity (possibly one you’ve never heard of), but instead it’s really all profit. Yes, they might have a charity registration number on the bucket, but it will be a fake. It’s not easy to identify the fakes, certainly not with so many charities around and asking for help. But there are some things you can do to make sure your donations really do go to a good cause. Where you receive requests from clothes, and you don’t know the charity, check their registration number with the Charity Commission’s Register of Charities, which is available online. It can be confusing, however, since some real organisations aren’t required to register. If you have any doubts or questions, contact the Charity Commission and ask them. Where people are collecting cash, come right out and ask if they’re a registered charity. If they’re the real thing, the collectors will be happy to talk about the work the charity does, and where they operate – they have absolutely nothing to hide. Sometimes charities actually employ professional companies to solicit donations for them, and in this case, real ones should tell you that, too. Don’t be afraid to ask how much of the proceeds actually go to the charity and what percentage the company keeps – it’s an important question. If you’re happy with the answers, then go ahead and give. The fakes, of course, will try to evade the questions, since they really don’t have the answers. 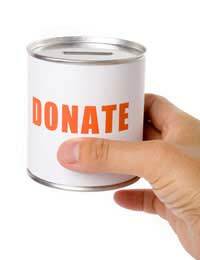 A collection box, by law, should be sealed (it’s actually illegal to collect donations in open buckets). Do they have identity badges? Anyone soliciting for charity is legally required to have and display an official permit. If they don’t have one, it’s a safe bet that they’re fakes. If you do come across fakes, you should inform the police, Trading Standards, and the Charity Commission. They’ll be able to take the appropriate action against the offenders.